Melasma, also called ‘chloasma’ or ‘pregnancy mask’, is a common skin condition of adults where brown or greyish patches of pigmentation develop, usually on the face. The name comes from melas, the Greek word for black, or cholas, from the word green-ish. It is more common in women, particularly during pregnancy (where up to 50% of women may be affected). Men can also be affected. Melasma is more common in people of colour and those who tan very quickly but can occur in anyone. It is important to note that it is not an infection; therefore, it is not contagious, and it is not due to an allergy. It is not cancerous and will not develop into skin cancer. The exact cause is unknown, but it is thought to be because the pigment-producing cells in the skin (melanocytes) are producing too much pigment (melanin). Several factors can contribute to developing melasma, including pregnancy and using hormonal medications such as oral contraceptive pills and hormone replacement therapy. Rarely, other medical problems that affect hormones (such as thyroid problems) may cause melasma, as well as some other medications, such as anti-epileptic drugs. 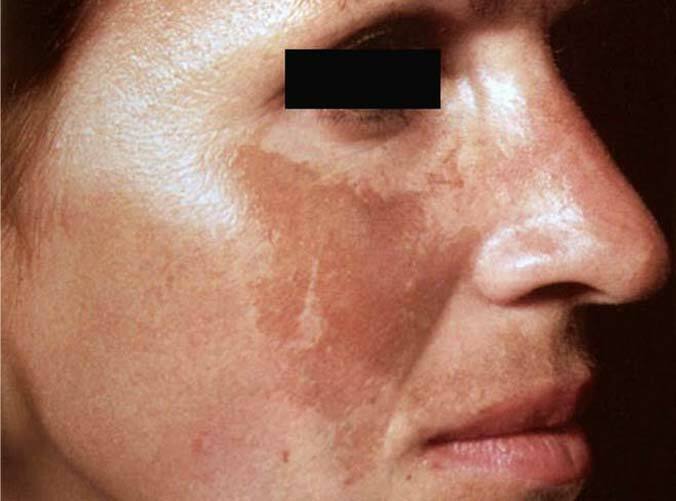 Exposure to ultraviolet (UV) light from the sun can trigger melasma or make it worse. The dermatologists at Atlantic Dermatology and Laser will assess whether your melasma is epidermal (superficial) or dermal (deep) as this will affect your treatment protocol. This will be done using a special test called a Wood’s lamp. We will also make sure that the diagnosis of “melasma” is correct as there are a group of conditions which can cause similar-appearing brown patches on the face which require different management. We will then discuss all the potential treatment options from lightening creams (both traditional and novel more natural alternatives) to chemical peels and oral supplementation. Sunscreens are critical in the management of this condition and we will take the time to explain which ones we recommend and how to use them most effectively. We understand how frustrating this condition can be and will help you to get it back under control.